Are you ready for the retail holiday season? Home News Are you ready for the retail holiday season? Holiday season is a key time of year for retailers. In fact, reports suggest that stores can expect to achieve between 10-20% of their annual sales during the holidays, so it makes sense to be prepared and ensure the customers with cash come to your store. Brand First – when planning your holiday display or signage, we suggest you incorporate your brand wherever possible. Remember, your brand is your identity and communicates a consistent message about your company which builds loyalty. By combining your holiday message with your branding, this will help create brand recognition long after the holidays are over. 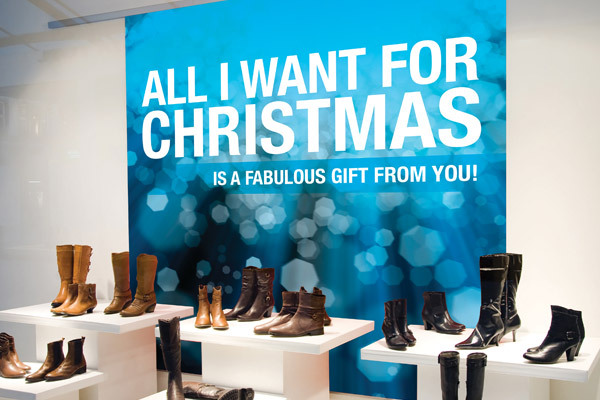 Use your imagination – the aim of any holiday retail signage is to catch customer’s attention. If there is a time of the year to push the boat out with an innovative and exciting design for storefront displays or banners, the holidays is it! Use color, texture, point of purchase displays with pop ups or testers or wall graphics in bold designs – there are no limits to the fun you can have with seasonal graphics. Window Displays – if your customers walk past and your window displays don’t catch their eye, they are likely to carry on walking. That is the last thing you want! Use your windows to highlight promotions, your best products, any seasonal offers and use eyecatching colors and text. Look at our portfolio of holiday graphics and retail displays for some great ideas on bringing your windows to life! In retail you need to plan for the holidays as early as possible, preparing in advance will help you deliver outstanding holiday sales results year on year. Talk to us at AGRetail about making this holiday season your best yet!